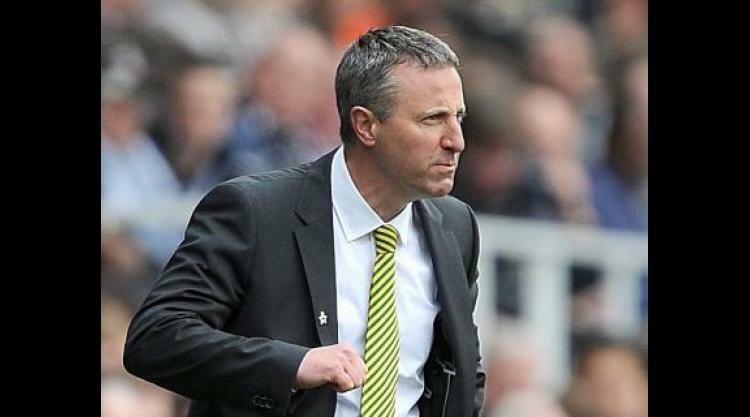 Norwich manager Neil Adams lamented his side's lack of precision in front of goal in their 1-0 defeat to Fulham, but believes the Canaries deserved at least a draw after they "dominated the game for long spells". Adams was taking charge of his first match in the Barclays Premier League, but Hugo Rodallega's first-half finish ensured it ended a disappointing afternoon for the visitors at Craven Cottage. The defeat comes as a crushing blow for the Canaries, who are now just two points clear of the relegation places with four matches to play. "It's hard to take, very hard to take - I couldn't have asked for any more," Adams said. "I thought they were first class. The desire they showed and the commitment they showed was excellent. "I thought we got it tactically spot on and I thought we dominated the game for long spells. "We had chances and we haven't taken them, and that's ultimately cost us." Norwich did have the better opportunities in the first half and Fulham had goalkeeper David Stockdale to thank for keeping the scores level. Ricky van Wolfswinkel went closest, diverting Martin Olsson's cross towards goal and forcing Stockdale into a smart save. "We haven't scored enough goals as a team all season and what makes it particularly galling is after a performance like that I thought we deserved something from the game," Adams said. "We can't ask for any more in terms of effort. "Of course we've got to find a way now of creating the chances and turning that effort and dominance of the ball into goals and ultimately points." Van Wolfswinkel arrived for Â£8.5million last summer but has endured a disappointing campaign, managing just one goal in 25 appearances this season. "Obviously Ricky needs a goal," Adams said. "He's come with a hefty price tag and he works his socks off - he gives you everything you want in a centre-forward but, of course, they're paid to score goals and he knows that. "If he gets one I think he'll go on a run, but it just doesn't seem to come for him at the moment." Even with their two-point cushion, Adams' side face an uphill task to hold off their relegation rivals. Their remaining four fixtures include home games against Liverpool and Arsenal either side of trips to Manchester United and Chelsea. "We've got four huge games against four of the best teams in Europe, not just in England," Adams said. "Do I have a points target? No, we've got to try and get as many points in as possible. "Of course we'll look at it game by game depending on other results and everyone will have an opinion on it but I don't think we can afford to do that. "We've got four massive games and we've got to go and try and get those points and hope that's enough." Fulham have a much kinder run-in than the Canaries. A tough trip to Tottenham next is followed by games against Hull, Stoke and Crystal Palace, who are all arguably clear of the relegation places. The win over Norwich was only the second time this season the Cottagers have recorded back-to-back victories and manager Felix Magath believes his side's confidence is growing. "We have won two games in a row and that helps us be confident - now there are more people who believe we will stay in the league," Magath said. "Two wins in a row is very nice, but it's not enough to stay up in the league, so we have to take care to get more points. "If we can, we have to do it next week at Tottenham."